Well, here she was, FINALLY! 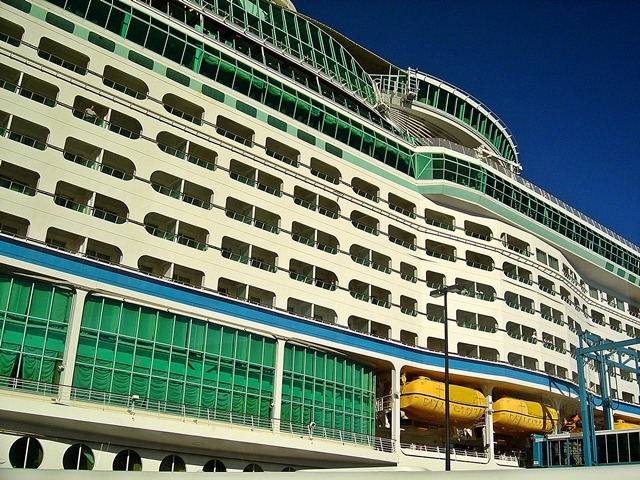 The flag ship that started it all for Royal Caribbean's mega gigantic Voyager class series, the Voyager of the Seas! Having sailed on her two incredible sisters, we felt it only fitting to try out the original- and when she actually came to our home state to cruise alternating weeks to Canada and the Caribbean, we thought it would be downright stupid not to take advantage of a cruise that required no airfare! This week was our actual 20th wedding anniversary (our family made our Navigator cruise into a celebration of our 20th anniversary 6 months earlier), and we wanted to make it a special cruise for just the two of us this time around. So we called Karen (our incredible travel agent!) and set up the trip. 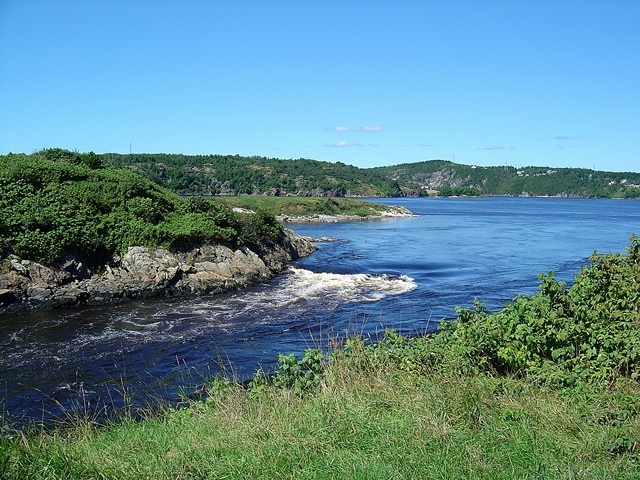 We chose the Canadian trip because it was an opportunity to explore a part of this beautiful nation. 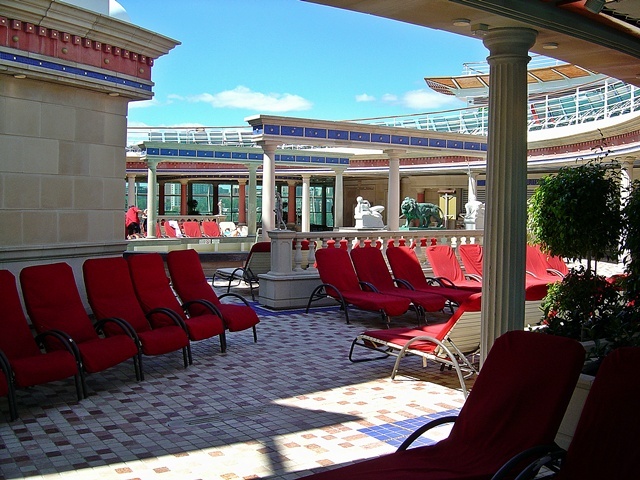 Voyager's Royal Promenade... the first one of it's kind at sea! Driving from home to the port was a first for us... no worries whatsoever about missed or delayed or cancelled flights or lost luggage! Just pack the car and drive north. The trip took about 1.5 hours, and traffic was surprisingly light for this Sunday morning. The port is Cape Liberty, Bayonne, NJ, a recently converted (from a former military base) and supposedly "no frills" (from what we read before hand) port. Surprisingly, the port was actually kind of cool and the staff there couldn't do enough to satisfy our needs. Driving into the gates, you drive down a long road that eventually cruises by some spectacular views of Voyager in the distance. After passing some old buildings, you see a turn off to the right for parking and a turn off to the left for luggage drop off (airport style with porters). We opted to turn left and drop off the luggage first, then proceeded as if leaving the port but then made an immediate left and another left to return to the intersection to the parking. We parked in a mostly empty lot (but we arrived way early) and proceeded to the port building itself. After going thru security we went on to the waiting area. We were going to take a cruise of NY Harbor, but it had been cancelled. So instead we headed to the Platinum/Diamond Crown and Anchor Society "lounge". 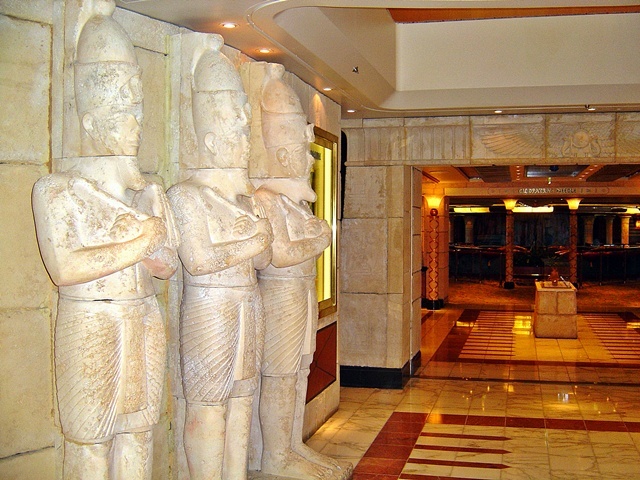 This was our first cruise as Platinum members, and we wanted to see the difference in waiting areas. Sure enough, there was a more secluded area set aside behind a curtain. There was a large screen TV and a table full of sandwiches and goodies to help pass the hours. In the regular seating area, there was also plenty to eat and plenty of TVs scattered about... plus places to get your photo taken. There was a fair like atmosphere as is typical on embarkation day for most cruises (and of course the handful of sour-pusses who are never satisfied with anything... miserable louts). Update 2009: this port has become more polished in most respects since this writing. Traffic control and parking is much better these days. At around 3pm, they started announcing that the buses would be taking us to the ship to go aboard! This was 3 hours earlier then we expected. We platinum and diamond members were taken over first (hey- neat perk!) aboard the high speed busses. It was an awesome sight... Voyager of the Seas practically in my own backyard! We quickly boarded the nearly empty ship and ran around to see as much as we could see before all the rest of the passengers started arriving. There were many shuttle buses, but the process is slow and I can only imagine what the line was like back in the port building. Eventually we got settled in and had our meals and did the necessary muster drills. Departure was on time and we passed by the incredibly gorgeous NY City skyline and out along Long Island. In passing, I saw Coney Island ("Warriors- come out to play-ay!") for the very first time. Going under the gigantic Verrazano Bridge aboard the equally gigantic Voyager of the Seas is a treat not to be missed! From the top deck, it really looks as though you're going to hit the bridge! It's fun to hear the crowd whooping and cheering as Voyager slips under the bridge! Our first day at sea was gorgeous- we saw whales (!) and schools of dolphin (!) and the waters were very calm... like cruising on a lake. The sunshine was warm and the pool area was very popular. This wasn't the image I had of a cruise to Canada. Even in the last week of August, I thought it would be on the nippy side... but the weather was perfect. 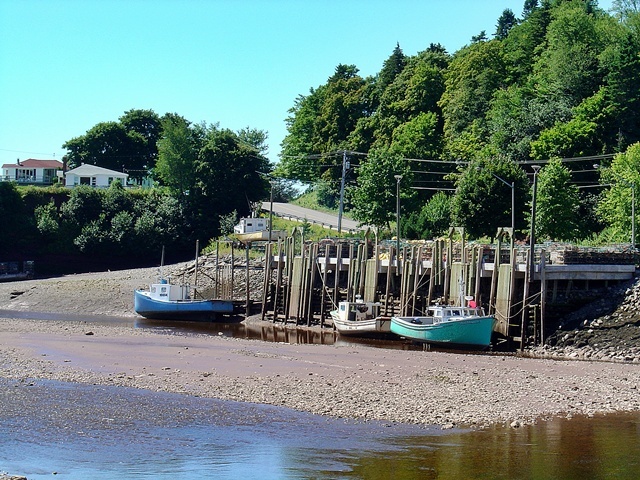 On the second day we arrived at our first port, St. John, New Brunswick in Canada! We were met by men singing and ladies handing out roses... a very warm welcome! St. John was a wonderful port. We took a tour with a great and humorous tour guide (I want to say her name was Jane?) who taught us SO much about this historical place. We stopped at a market then went on to the Bay of Fundi and saw the incredible sight of boats sitting on mud! The entire bay empties out and refills with the tides everyday! We didn't get to see the bay refill, but the pictures of it empty were something out of the Twilight Zone. We also picked up some " lucky" quartz stones. We were also taken to see some beautiful shooting rapids. 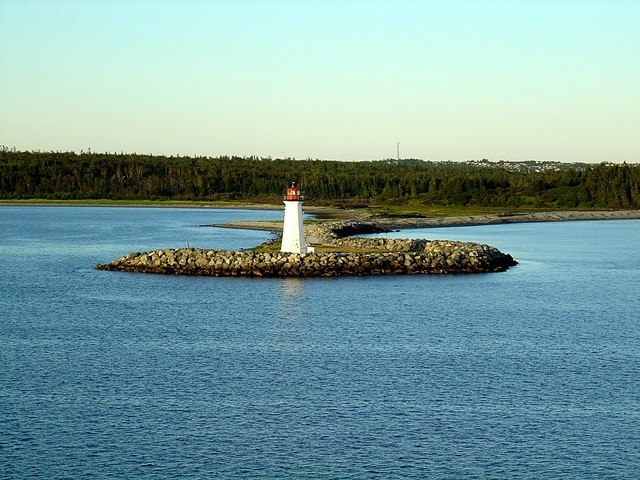 The third day out we spent at our second and last port in Canada, Halifax, Nova Scotia! In Nova Scotia, we were met by kilted guards in a large warehouse-style shopping mall. 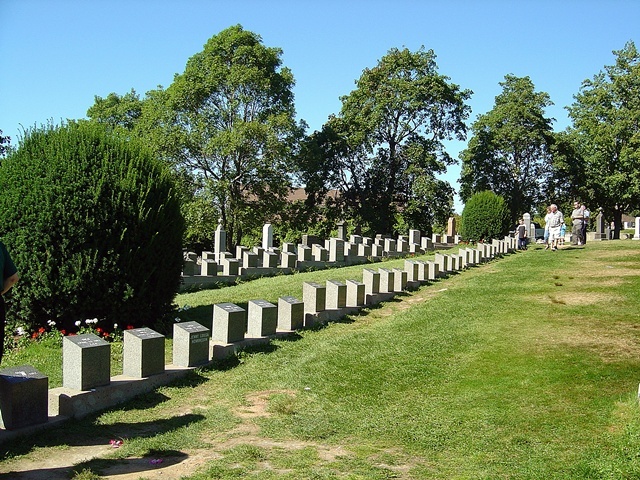 We boarded a tour that took us to a Titanic exhibit at the Maritime museum (a place I wished I had more time to explore) and we then were taken to 3 cemeteries where the bodies of the Titanic disaster were interred. This was both illuminating and sad... this tragedy did a lot to make modern ocean travel so much safer. 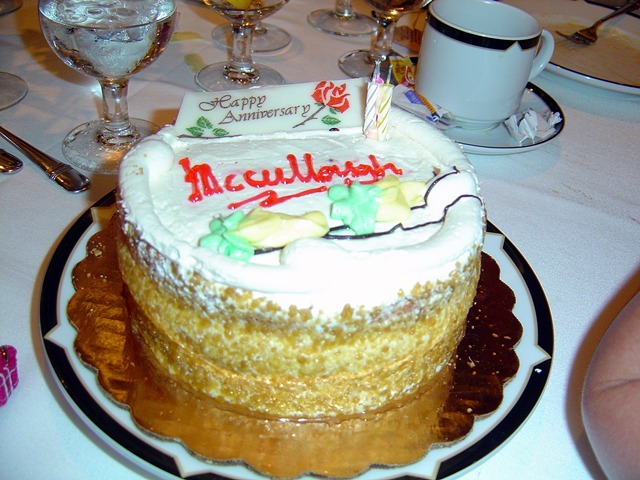 We had a great dinner this night on our 20th anniversary in the ever popular Portofino's Restaurant. 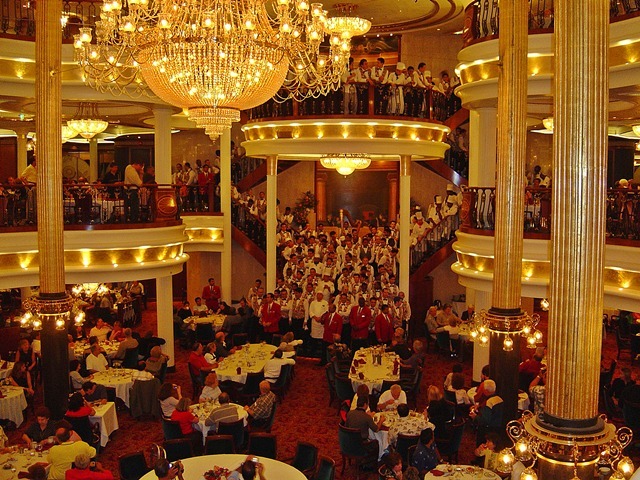 (If you miss this restaurant, you've missed a big part of the cruise!) Our final day at sea was just as beautiful as the first... and once again, whales were spotted along with the dolphins. As for the ship, we were very pleasantly surprised! For being the oldest of the Voyager-class sisters, she was beautiful inside and out. Her main dining room easily matched the beauty of Navigator's... and definitely exceeded that of the Explorer. Her disco actually felt like an old fashioned disco, rather then the dark dungeon discos (which are still FUN!) of Explorer and Navigator, the disco here was a huge cylinder and had a fun bar wrapped around a wall. The furniture was a bit wacky though. The Schooner bar was somehow always smelling of cork (pleasantly so) and this added to the "schooner" feel. I don't remember this on Navigator or Explorer. 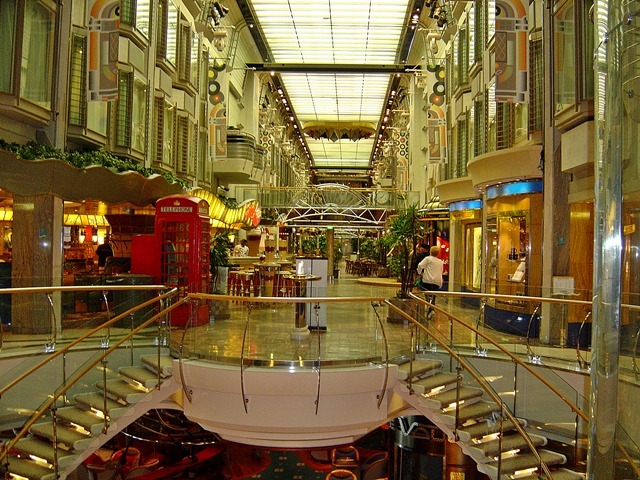 The Royal Promenade was not as spectacularly decked out as Navigator, but again, it was just as nice as Explorer's. (It should be remembered that the Voyager and Explorer were the first two models of this series and they share a lot of ideas... I haven't been onboard Adventure, so I'm not sure what she's like. Navigator and Mariner were the last two of the series and as such, have their own looks and upgrades) Our cabin, a "D" class was ideally located and as always, more then spacious enough for us two little people. The food was delicious and we had some excellent tablemates along with us! Disembarkation was smooth as could be; we left the ship early, got our luggage and walked to the car! We were off the ship by 10am and home by noon! That's the way to cruise! To see more digital picture highlights of this cruise, press HERE!